Because today is National Garlic Day, we’ve made sure this recipe has a healthy dose of our favorite aromatic. 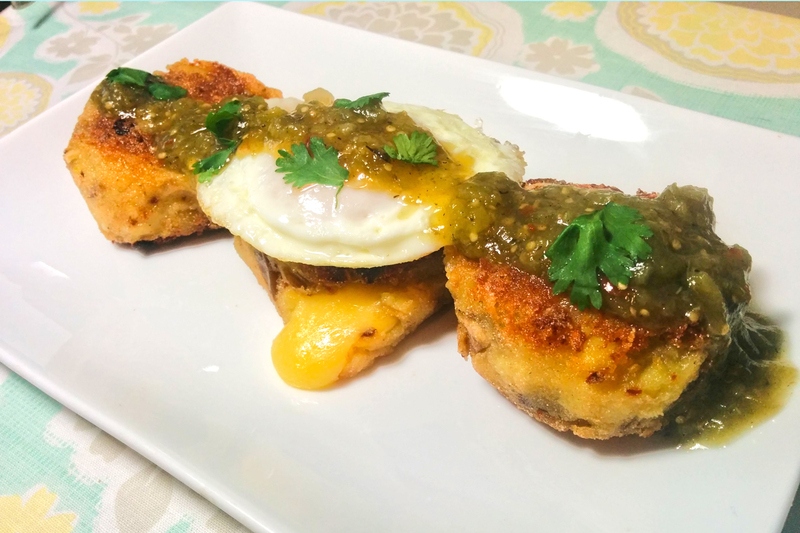 This recipe is a spin on a traditional Ecuadorian recipe called llapingachos, where leftover cooked potatoes are stuffed with cheese and served alongside steak and eggs with a peanut sauce. It’s my all-time favorite breakfast and once you try it, you’ll understand why! There are a thousand recipes for cheesy potato pancakes out there, but this style of stuffing the cakes with cheese takes the–well, it takes the cake. Follow this extra-extra-cheesy and slightly spicy recipe to have a brunch you won’t forget this weekend. It’s a little labor intensive to make these delicious savory breakfast cakes, but it’s definitely worth it when you taste the result. If you make a large batch at once, you can freeze them indefinitely. Pop them in the oven or microwave to defrost, then pan fry each potato pancake for a little crisp. 1) Dice potatoes and boil them until tender. Drain water and chill. 2) Roast potatoes whole in oven until easily pierced with a fork. Cut open and chill. 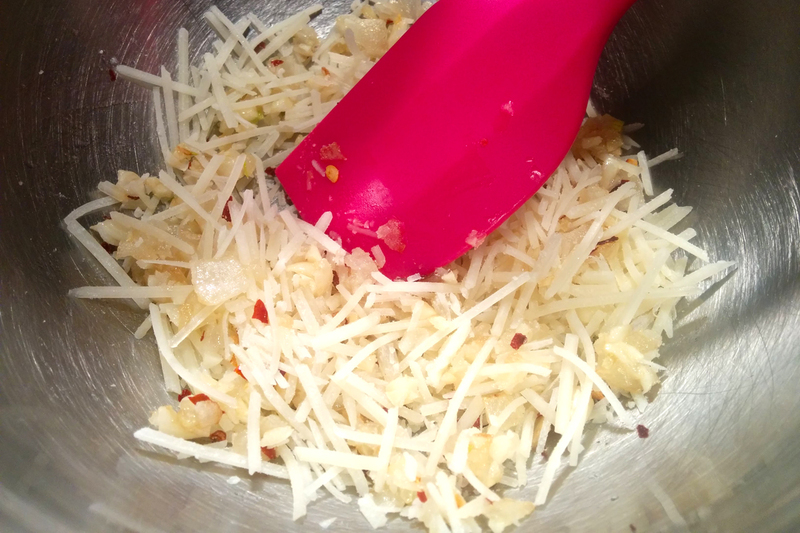 In a bowl, combine parmesan, garlic, salt and pepper until evenly distributed, then crush potatoes into the mixture. Combine by hand to get the best distribution, but be careful not to overwork the potatoes. 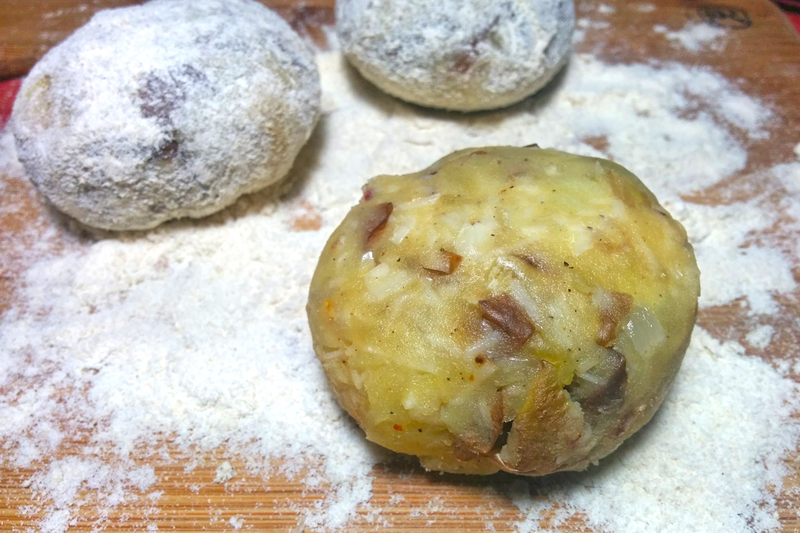 Roll handfuls of the potato mixture into 2.5″ balls. Next, push a cube of chihuahua cheese into the center and reform the ball around the cheese cube by rolling it in your hands. Flatten each ball until a pancake about 1″ high is formed. You may need to reroll it after flattening to ensure the cheese is surrounded with potato. 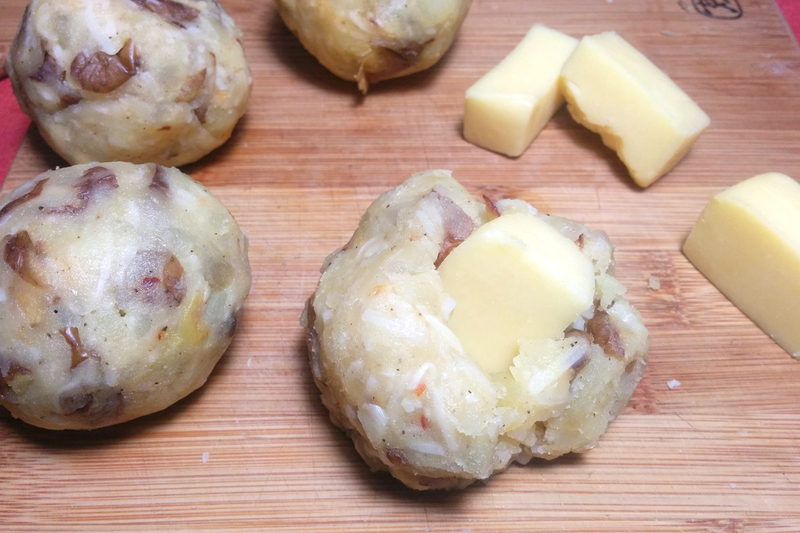 [Optional Step] Spread masa marina or flour onto a cutting board and roll each cheesy potato pancake in it until lightly coated. Heat plenty of oil in a non-stick skillet over medium heat. Cook the cheesy potato pancakes 2-3 minutes per side. Each side should be a bright amber color. If the sides of your cakes do not brown, you may need to use tongs to make sure the masa or flour gets cooked. You can also baste the sides with oil while frying instead, but be careful! 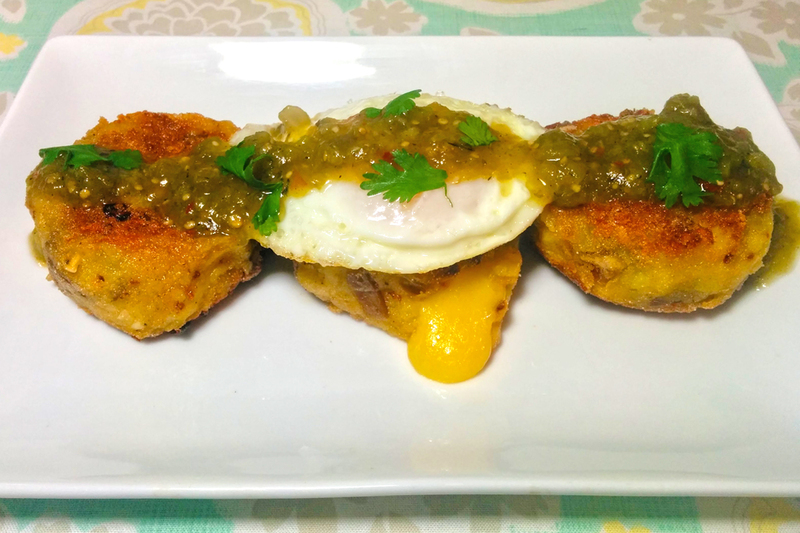 Serve with fried eggs, steak, salsa, hollandaise, fresh cilantro, or any savory breakfast favorites. Stay tuned for other llapingacho potato pancake and llapingacho-inspired recipes! Next Our Next Gift Box Release: The Campfire Kit to Amp up Your Grill, Picnic, and Outdoor Cooking!